Sister M. Jonathan, Midwest regional superior, assisted Auxiliary Bishop Mark S. Rivituso as he blessed the new Missionaries of Charities’ soup kitchen in north St. Louis after Mass Aug. 16. 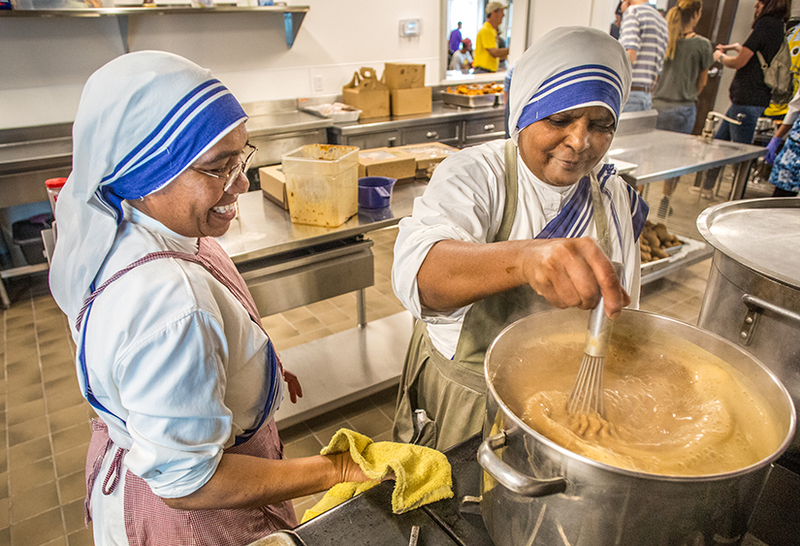 Sister M. Abelette, left, assisted Sister M. Stellinda as she stirred a pot of gravy on the stove at the Missionaries of Charity’s new soup kitchen Aug. 17. 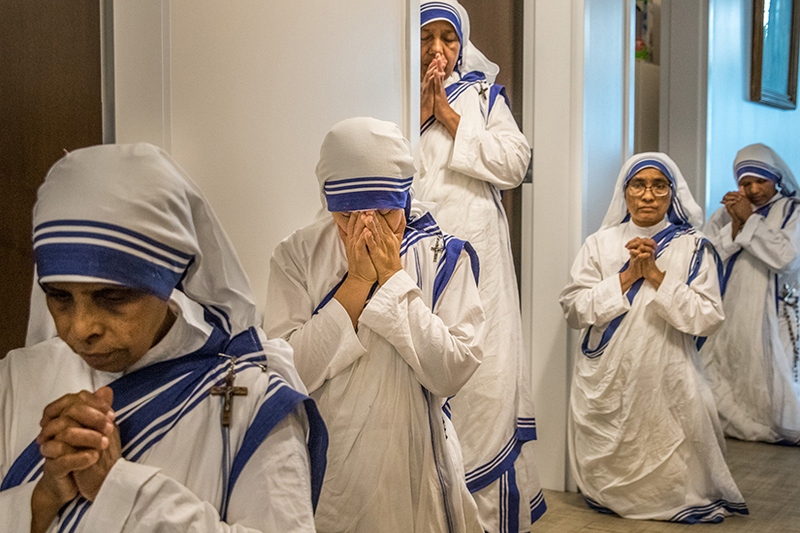 The Missionaries of Charity, a religious order founded by St. Teresa of Calcutta, have ministered to the poorest of the poor in St. Louis for nearly 40 years. Mass was the first order of the day in the dining hall of the Missionaries of Charity soup kitchen. At the conclusion of Mass, the altar was moved back into the small chapel, and the dining area placed back in order. By mid-morning, the food was set out on a serving line. The menu that day included fried chicken, fresh zucchini and cheese sauce, rice and gravy, cookies, water and cans of soda — all of which had been donated to feed a community in need. Spiritual nourishment, followed by the physical. It’s been the mission of the Missionaries of Charity since they began serving the poorest of the poor in St. Louis nearly 40 years ago. On this particular day, it also was the first meal served at the sisters’ new soup kitchen, which was blessed at a Mass the day prior on Aug. 16. The building officially opened to the community Aug. 17, and replaced the previous soup kitchen building, which had operated at the corner of Cottage Avenue and North Spring Avenue in the Jeff-Vander-Lou neighborhood of north St. Louis for decades. Ground broke last November on the 7,100-square-foot facility and was completed in about 10 months. The building’s construction and design was overseen by BSI Constructors and Lawrence Group. During a period of several weeks earlier this month when the old building was knocked down and the new one not yet opened, the sisters continued to hand out meals on the grounds outside. The sisters’ work is rooted in the Eucharist, explained Sister Stellinda. They see their lives as seamless, with four hours of prayer woven into each day, along with an apostolate of service. Beyond the soup kitchen, the community has an emergency shelter for women and their children, with accommodations for 11. Other ministries include an after-school program and summer camp for children, as well as catechesis. The sisters frequently visit with people and walk the streets to meet others in the community, and learn how they can best serve them. 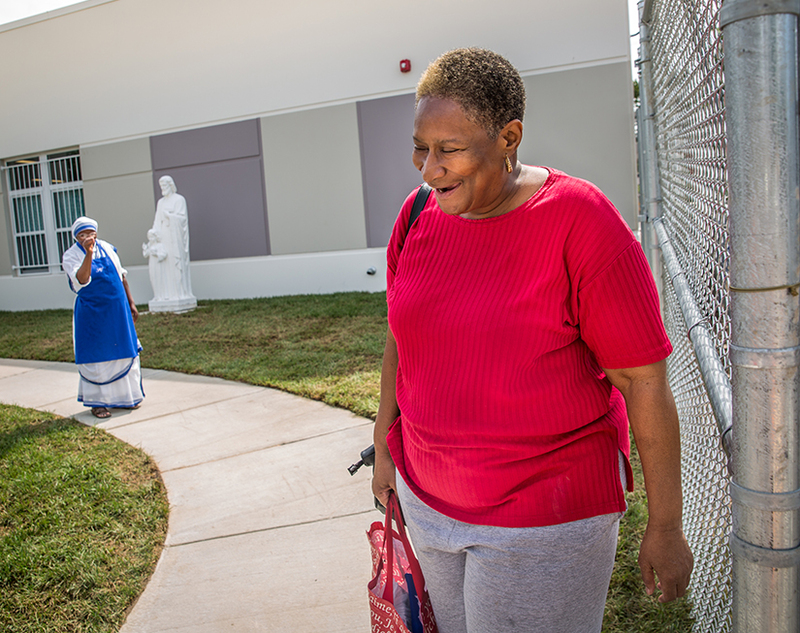 Missionaries of Charity prayed during Mass at the community's new soup kitchen Aug. 16. The sisters have remained in the Jeff-Vander-Lou neighborhood of north St. Louis, just a few blocks north of Sts. Teresa and Bridget Parish. St. Louis has since become a hub for the Missionaries of Charity in the Midwest, which extends from Canada to Louisiana. The sisters, she said, are like spiritual mothers. “They’re like mothers with their children and they help you, as long as you stay focused,” she said. Sue Jochens of St. Joan of Arc Parish in south St. Louis has been volunteering with the Missionaries of Charity for 12 years. This is the place where the works of mercy come to life, she said. 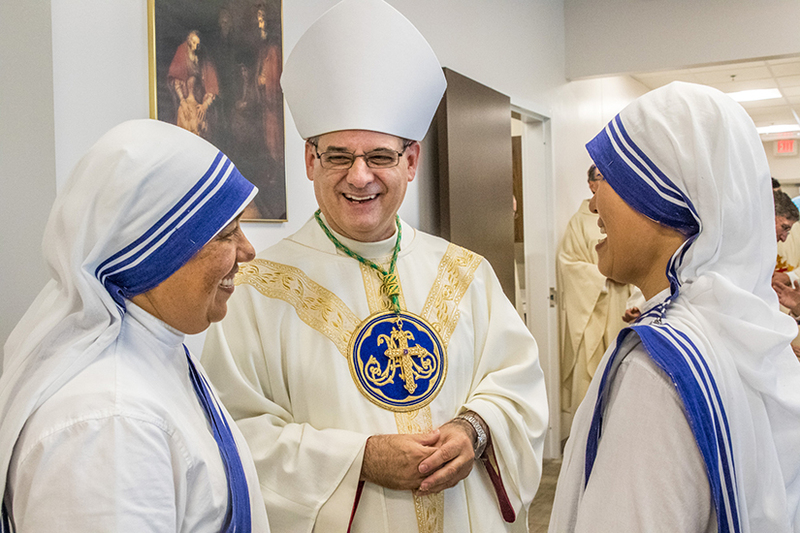 Auxiliary Bishop Mark S. Rivituso celebrated Mass for the Missionaries of Charities and blessed their new soup kitchen on Aug. 16. He talked with local superior, Sister M. Marilyn, left, and Midwest regional superior, Sister M. Jonathan. A Mass in celebration of St. Teresa of Calcutta’s feast day will be celebrated at 5:30 p.m. Wednesday, Sept. 5, at Sts. Teresa and Bridget Parish, 3636 N. Market St. at Grand Blvd. in north St. Louis. Cardinal Carberry repeated his request to her at that time, and the tour was intended to convince the nun that the sisters were needed in St. Louis. The Yugoslavian-born saint worked in Kolkata among the poor, lepers, homeless and starving. Her work was recognized worldwide, including a nomination for the 1975 Nobel Peace Prize. As of 2015, there were 5,150 active and contemplative sisters serving in 758 houses in 139 countries, according to information from the Missionaries of Charity website. There are 17 houses in the Midwest. The first group of Lay Missionaries of Charity made private vows in the presence of Mother Teresa (St. Teresa of Kolkata) in 1984. The movement was approved by Rome in 1987. A chapter was started in St. Louis in 1991. The group is open to single and married people. Members make a private act of consecration by vowing to live lives of poverty, chastity, obedience and service of the poorest of the poor. Vows are renewed yearly. Lay missionaries take on a personal responsibility to their families and Church first, and their patron is the Holy Family of Nazareth, a model of life and source of inspiration. The group also is contemplative in nature, with a focus on prayer. There are currently 16 lay Missionaries of Charity in St. Louis. Father John Paul Hopping is spiritual director of the group, which meets twice a month for a Holy Hour on the first Monday of the month, followed by Mass and spiritual direction on the third Monday of the month. For more information on the Lay Missionaries of Charity in St. Louis, contact Ada Cross at (314) 481-5789.